Notes for Simple Harmonic Motion chapter of class 11 physics. Dronstudy provides free comprehensive chapterwise class 11 physics notes with proper images & diagram. Any motion, which repeats itself in equal intervals of time is called periodic motion. Oftenly, the displacement of a particle in periodic motion can always be expressed in terms of sine and cosine functions. Since the term harmonic is applied to expressions containing these functions, periodic motion is also called harmonic motion. The basic quantities characterizing a periodic motion are the amplitude, period and frequency of vibrations. 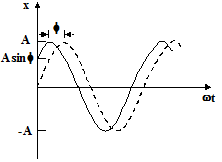 The amplitude of oscillations is the maximum displacement of a vibrating body from the position of equilibrium. The time period of oscillations is defined as the time between two successive identical positions passed by the body in the same direction. In mechanical oscillations a body oscillates about its mean position which is also its equilibrium position. 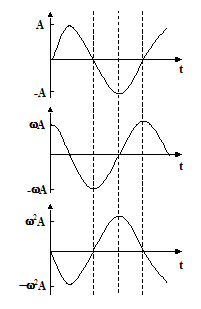 At the equilibrium position no net force (or torque) acts on the oscillating body. The displacement (linear or angular) of an oscillating particle is its distance (linear or angular) from the equilibrium position at any instant. When a body is displaced from its equilibrium it is acted upon by a restoring force(or torque) which always acts to accelerate the body in the direction of its equilibrium position as shown in the figure. Such an oscillatory motion in which restoring force acting on the particle is directly proportional to the displacement from the equilibrium position is called Simple Harmonic Motion. 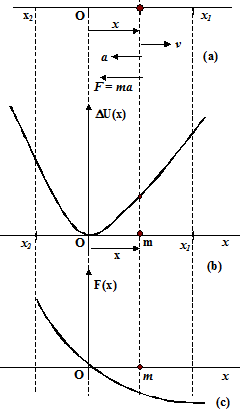 The potential energy function of such a particle is represented by a symmetric curve as shown in the figure. Note that the limits of oscillation are equally spaced about the equilibrium position. This is not true for the motion shown in figure, which is harmonic, but not simple harmonic. The above equation is called the differential equation of SHM. It gives a relation between a function of the time x(t) and its second derivative . To find the position of the particle as a function of the time, we must find a function x(t) which satisfies this relation. Although all the above three equations are the solution of the differential equation but we will be using x = A sin (w t + f) as the general equation of SHM. - The frequency and period are independent of the amplitude. - This implies large oscillations have the same period as small ones. In equation, the argument (wt+f) is called the phase, where f is called the phase constant. Both the phase and the phase constant are measured in radians. The value of f depends on the position wherefrom we start measuring time. The characteristic of the differential equation is that it does not represent one single motion but a group or family of possible motions which have some features in common but differ in other ways. In this case w is common to all the allowed motions, but A and f may differ among them. The amplitude A and the phase constant f of the oscillation are determined by the initial position and speed of the particle. These two initial conditions will specify A and f exactly. One very important distinctive feature of SHM is the relation between the displacement, velocity and acceleration of oscillatory particle. This is the standard differential equation of SHM. Notice that the maximum displacement is A, the maximum speed is wA, and the maximum acceleration is w2A. The displacement, velocity and acceleration versus time graphs have been plotted in figure. The velocity function is p/2 ahead of the displacement function and the acceleration function is p/2 ahead of the velocity function. For SHM to occur, three conditions must be satisfied. At the stable equilibrium, the potential energy is minimum. The acceleration is proportional to the displacement and opposite in direction. The position of a particle moving along x – axis is given by x = 0.08 sin (12t + 0.3) m where t is in second. (a) What is the amplitude and the period of the motion? (b) Determine the position, velocity, and acceleration at t = 0.6 s.
i.e. y = A sin (wt + f), we see that the amplitude is A = 0.08 m and the angular frequency w = 12rad/s. Thus, the period is T = 2p/w = 0.524 s.
At t = 0.6 s, the phase of motion is (12 0.6 + 0.3) = 7.5 rad. x = 0.075 m, v = 0.333 m/s, and a = -10.8 m/s2. 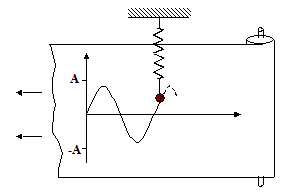 Let us find out the time period of a spring-mass system oscillating on a smooth horizontal surface as shown in the figure. At the equilibrium position the spring is relaxed. When the block is displaced through x towards right, it experiences a net restoring force F = -kx towards left. The negative sign shows that the restoring force is always opposite to the displacement. That is, when x is positive, F is negative, the force is directed to the left. When x is negative, F is positive, the force is directed to the right. Thus, the force always tends to restore the block to its equilibrium position x = 0. Note that the time period is independent of the amplitude. For a given string constant, the period increases with the mass of the block – a more massive block oscillates more slowly. For a given block, the period decreases as k increases. A stiffer spring produces quicker oscillations. Find the period of oscillation of a vertical spring-mass system. Let xo be the deformation in the spring in equilibrium. Two masses m1 and m2 are suspended together by a massless spring of spring constant k. When the masses are in equilibrium m1 is removed without disturbing the system. Find the angular frequency and amplitude of oscillation of m2. For the arrangement shown in the figure, find the period of oscillation. Obviously, when the block is displaced down by x, the spring will stretch by . The net restoring force on the block is T.
Note that we have not taken gravity into account as it does not affect the time period. 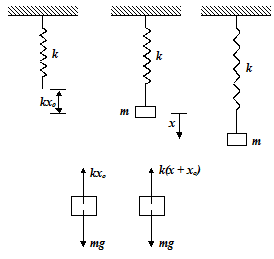 Ideally, a simple pendulum consists of a point mass suspended at the end of a massless string as shown in the figure. At the equilibrium position, net torque about the point ‘O’ is zero, at . The pendulum having a time period equal to two seconds is called a second’s pendulum. In figure, an extended body is pivoted freely about an axis that does not pass through its center of mass. Such an arrangement forms a physical pendulum that executes simple harmonic motion for small angular displacements. If d is the distance from the pivot to the center of mass, the restoring torque is –mgd sin . If the location of the center of mass and d are known, then a measurement of the period allows us to determine the moment of inertia of the body. 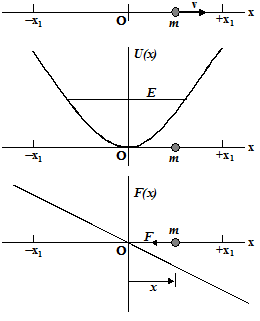 A rod of mass M and length L is pivoted about its end O as shown in the figure. Find the period of SHM. 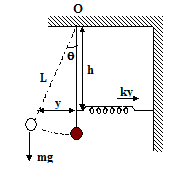 A simple pendulum of length L and mass m has as spring of force constant k connected to it at a distance h below its point of suspension. Find the frequency of vibrations of the system for small values of amplitude. As shown in figure, if the pendulum is given a small angular displacement q, the spring will also stretch by . So there restoring torque about O will be due to both force of gravity and elastic force of the spring. Suppose a tunnel could be dug through the earth from one side to the other along a diameter, as shown in figure. 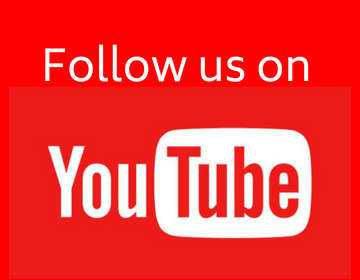 Show that the motion of the particle is simple harmonic and determine its time period. The gravitational force on the particle at a distance r from the centre of the earth arises entirely from that portion of matter of the earth in shells internal to the position of the particle. The external shells exert no force on the particle. where is the gravity on the surface of earth. This is the differential equation of SHM. 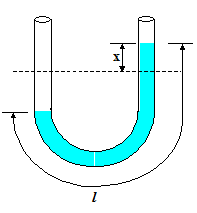 An ideal liquid of density r occupies length l of an U – tube of uniform cross-section as shown in the figure given below. When the liquid surface is displaced through x the liquid column executes SHM. Find the period of oscillation. When the liquid column is displaced through x on the right side, the weight of the unbalanced liquid provides the restoring force. Thus, the total energy of SHM is constant and proportional to the square of the amplitude. The variation of K and U as function of x is shown in figure When x = ±A, the kinetic energy is zero and the total energy is equal to the maximum potential energy. There are extreme points or turning points of the SHM. The variation of K and U as function of t is shown in figure. Note that the frequency of variation of the kinetic and potential energy is twice that of the frequency of oscillation. 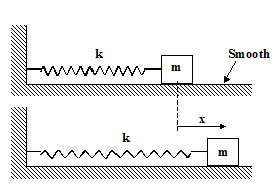 A solid cylinder of mass M and radius R is attached to a spring of stiffness k as shown in the figure. The cylinder can roll without slipping on a rough horizontal surface. Show that the centre of mass of the cylinder executes SHM and determine its time period. Consider the situation when the spring is extended by x.